The first Bank Notes issued in Gibraltar date back to 1914. These Bank Notes were issued under emergency wartime legislation - Ordinance 10 of 1914. The position was well summarised in a Minute dated 2 February 1925 written to the Colonial Secretary by the Gibraltar Government Treasurer, The Hon W A Bowring JP, which reads as follows: “At the outbreak of the war in 1914 notes designated as ‘Bank Notes’ were issued by the Government of Gibraltar to assist the Anglo-Egyptian Bank to meet its liabilities in the event of a run either on its own institution or the Government Savings Bank.” In 1914, there was indeed a run on the bank and the Government was compelled to make an emergency issue of notes. Alongside the Anglo-Egyptian Bank Notes in circulation in Gibraltar at the time were British Territory Notes. British Territory Notes were readily accepted by the public and had an advantage over the local Bank Notes in that - in the words of the then Secretary of State - “they can be supplied to passing ships and are well recognised as readily negotiable paper in adjacent foreign countries”. (Extract from a Despatch dated 2 January 1925 from The Right Honourable L S Amery, Secretary of State - Colonial Office, Downing Street - to the Governor of Gibraltar General Sir Charles Carmichael Monro). Following this initial issue of Bank Notes, it was on 21 October 1915 when the Secretary of State, in his Despatch No 108, formally approved the arrangements for the issue of currency notes by the Government of Gibraltar. However, new legislation in the form of the Currency Notes Ordinance was not enacted until 1927. The Monetary Unit of Gibraltar is actually Sterling. The UK’s Coinage Acts of 1870 to 1946 as well as the Decimal Currency Acts of 1967 and 1969 applied to Gibraltar by proclamation. 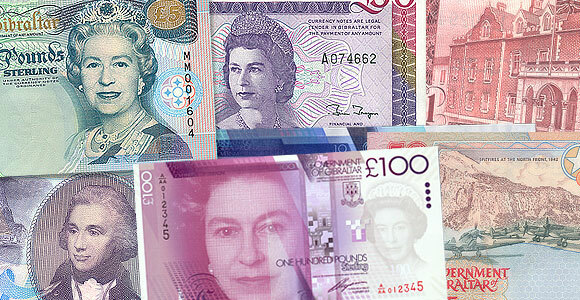 Gibraltar’s Currency Notes Ordinance did not create a separate currency but conferred on the Government of Gibraltar the authority to print currency notes, which were legal currency in Gibraltar. Sterling Currency Notes issued by the Bank of England have therefore been legal tender and in circulation in Gibraltar alongside the local note issues, since these early days. The Government of Gibraltar has always tried to encourage the use of the local currency and to increase the notes in circulation figure. Any issue of local currency notes to the banks requires a deposit of equivalent value to be made to the Government. These deposits are invested in the ‘Note Security Fund’ and the investment income is an important source of income for the Government.